Well hello there! As I’ve mentioned before, I’ve been taking the The Herbal Academy’s Introductory Herbal Course over the past several weeks, and I’ve been loving it! I already had a basic knowledge of medicinal herbs so I wasn’t sure how much I would learn from this course, but it has really surprised me how comprehensive it is. 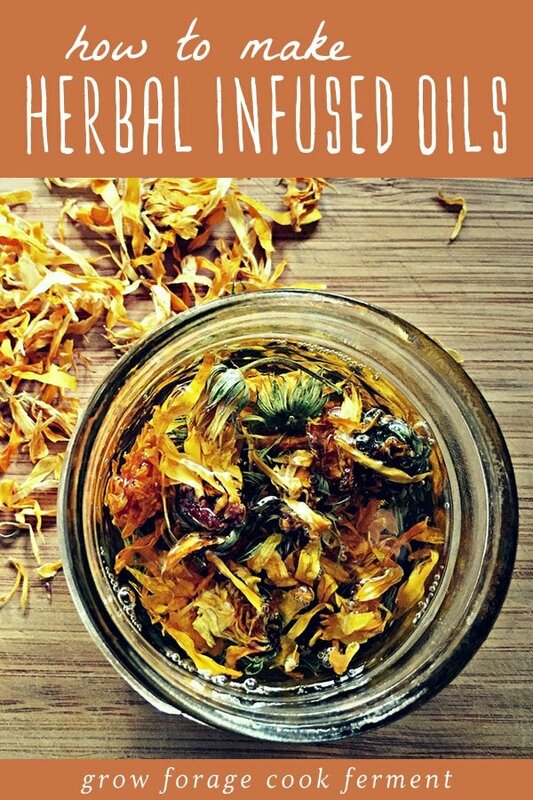 One important topic that this course covers is how to make infused herbal oils, which is the first step in making numerous body care recipes like herbal salves, body butters and creams (such as my calendula cream). 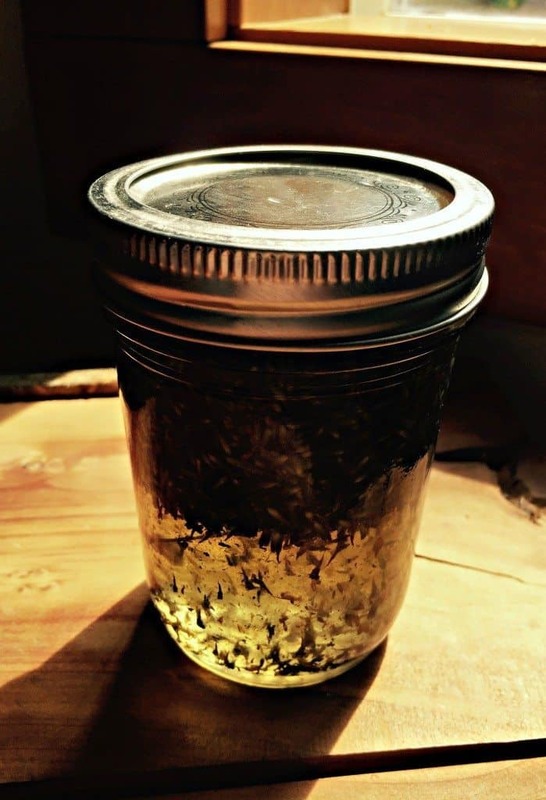 This is a great time of year to start thinking about making herbal oils as you hopefully have some dried herbs laying around that you’ve collected throughout the summer. 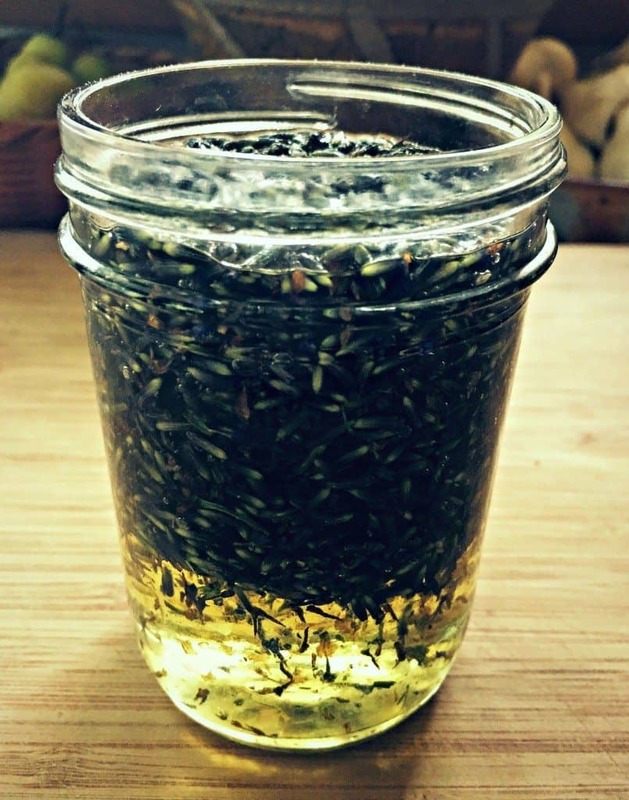 The first thing you need to make an infused oil is dried herbs. It is very important that the herbs are totally dry before you combine them with oil, as they can cause rancidity otherwise. Many different types of herbs work well for making infused oils, especially lavender, rosemary, calendula, plantain, yarrow, comfrey, and mullein. If you don’t already have your own dried herbs, Mountain Rose Herbs has a great selection of medicinal herbs to choose from. Then you will need to choose the oil that you want to use. I usually use a high quality, light olive oil, but there are many types of carrier oils that you can choose from. 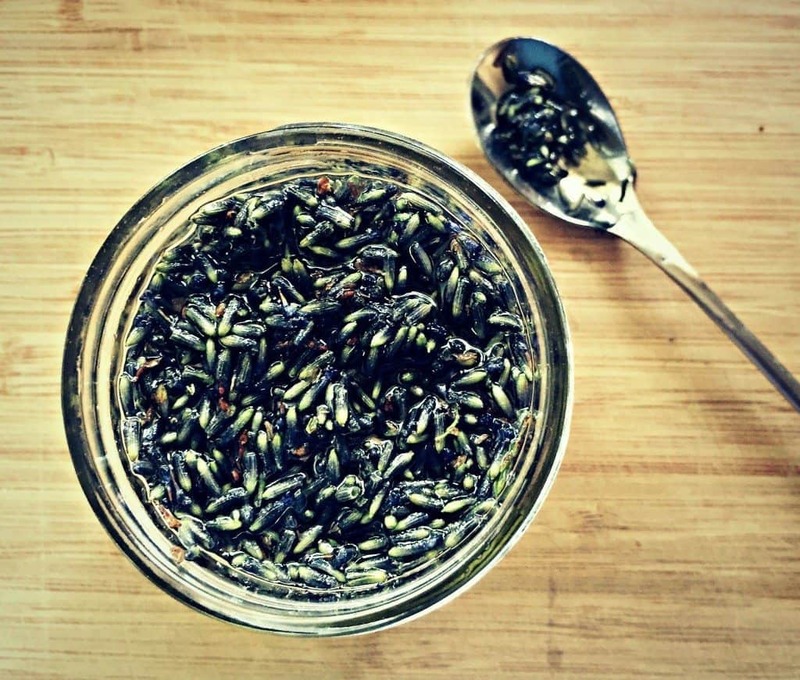 Once you have those two simple ingredients, there are several ways of making infused herbal oils. The first one is probably the easiest, but it does take the most time. Simply put the dried herbs of your choice into a jar and cover them with oil. Stir the mixture gently with a spoon to get as many of the air bubbles out as possible. Then put in a sunny windowsill for several weeks to steep. When you feel it’s ready, simply strain the herbs from the oil. Cap with a lid and use as soon as possible. Once oils have been infused they have a shorter shelf life, so I try to only make as much as I’ll use within a few months. Any extra you might have should be stored in the refrigerator for future use. 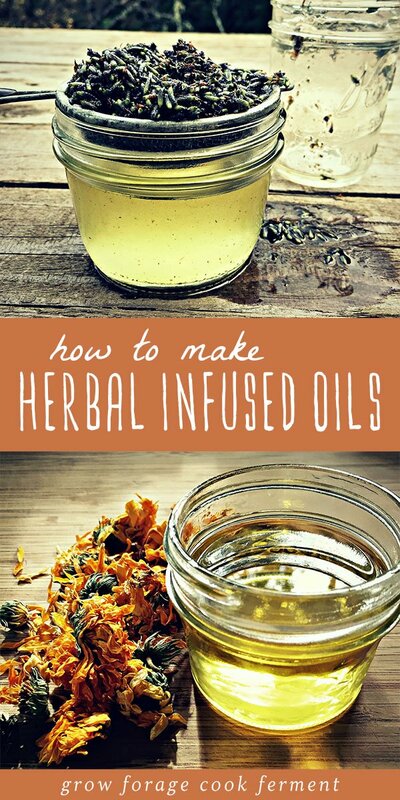 There are quicker ways of making infused herbal oils, as well. You can use a double boiler by putting the herbs and oil in a metal bowl over a pot of simmering water. Make sure that the oil doesn’t get too hot as to fry the herbs, and it should be done in a matter of hours. 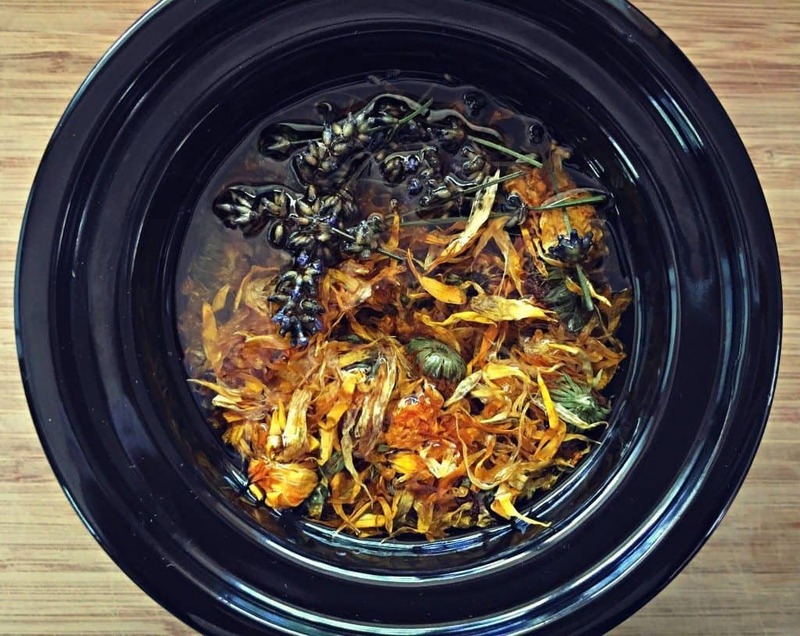 I’ve also used a mini slow cooker on the warm setting to make calendula oil with good results. A dehydrator would also work well, especially if you are already using it for something else. I frequently use mine to make yogurt, so it’s really easy to add in an extra jar or two of herbs in oil. The last method that is recommended by the The Herbal Academy is oven extraction. I have never done this, but it’s the same idea as using a dehydrator. Put the dried herbs in oil, cover, and put in a low temperature oven for several hours, making sure not to cook the herbs. Really, it’s as simple as that! One thing that this course has taught me is that herbal remedies don’t have to be difficult. 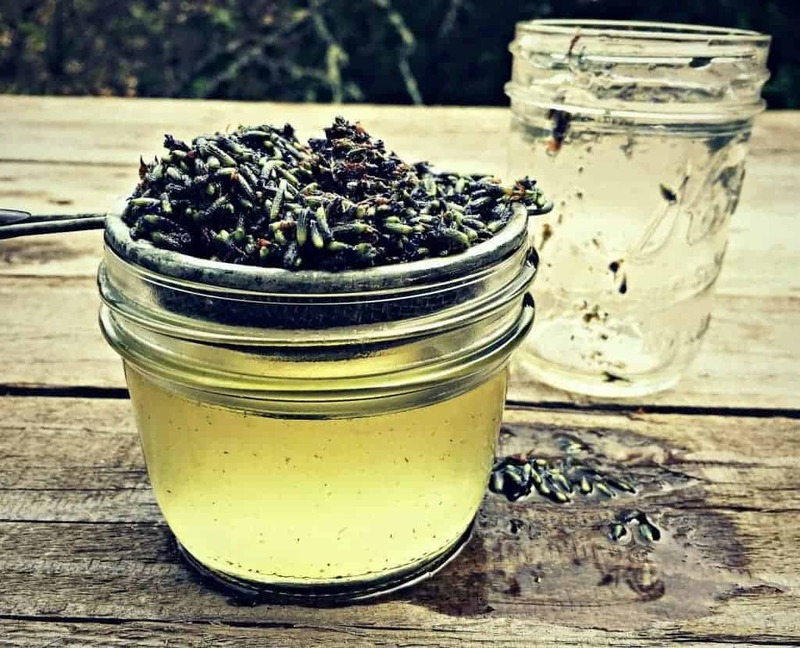 While making an infused oil sounds like it could be complicated, it really is as easy as putting two ingredients together and letting them sit in the sun for a few weeks. If you can make a cup of tea then you can do this! Now comes the fun part… deciding which herbs you want to infuse! Can i use coconut oil to infuse blackseed? As much room as the herbs take up in the jar, add that much oil and a little more. Even if the herbs float this is ok. Leave a little room for air! Some things expand with heat. The jar-in-crockpot is a little like the double boil method, so I placed a small towel on the bottom of the crockpot to protect the glass jar from breaking. Maybe not necessary but some herbs are expensive so I take the precaution. You fill the crockpot with hot/warm water enough to “bathe” the jars but not enough to cover the lids of the jars. We don’t want water in our infusions! Some people weight down the jars so that they don’t float. I don’t usually have that problem. The warm setting is usually enough in that 200 degree range (but not higher than this to avoid boiling and cracking!) Put the lid on the crockpot. Leave it in for as long as it needs (some of my glycerites need 2 whole days.) Occasionally swirl the jars if it’s recommended for the herb you’re using. If the water level gets low from evaporation, you can add more warm water to the crock. Don’t let the crock dry completely out. After the infusion process it’s recommended to let the jars cool a little and dry the outside completely. There will be some negative pressure when opening, but I strain with cheese cloth so it’s necessary or I burn myself. Strain your infusion into your container of choice to store for the next part of your process. Some recommend dark blue or brown bottles/jars to protect from further light. Ps. I love the lavender scrub idea. I save my cheesecloth strains for poultice for later. 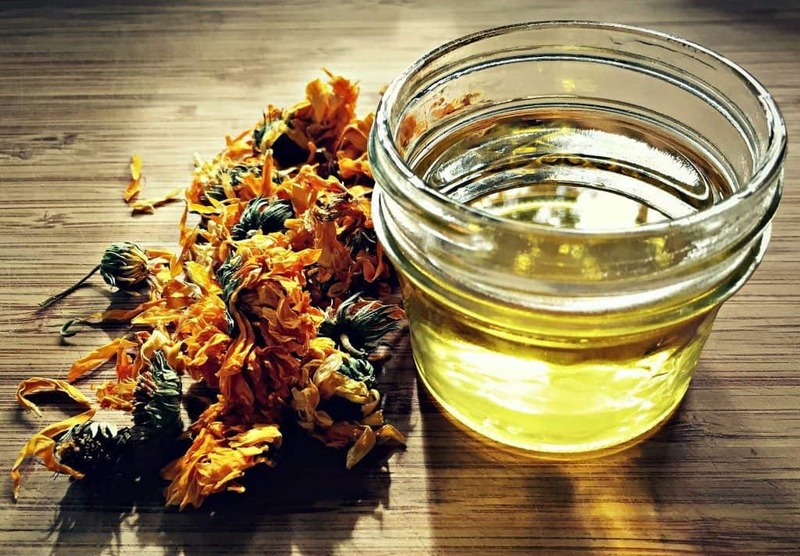 Can calendula infused oil be replaced with calendula essential oil for making the salve? If so how much would I need to use? If the infused oils have a short shelf life, would adding vitamin e help? Ive recently made a concoction with sage and glycerin.. just wondering how to keep it fresh i guess. I found this article through your article about purple dead nettle. If I make an oil out of that, would I use all parts of the plant- stem, leaves and flowers? Another way to make your infused oil is with the Magical Butter Machine. I got one this last year abd it is so easy to use and you can use it for making lots more than just oils. HI! I was just wondering could i use coconut oil to infuse instead of these other oils you’ve mentioned? I don’t see why not. I use coconut oil in my cannabis salve and it works great. Coconut oil has healing properties of its own. What about grinding the calendula before infusing and use the already measured oils once they are infused? Leaving the calendula in the soap? If you make a lot of oil use olive oil, it lasts much longer. I’ve use almond and grape seed and when I made in bulk my salves didn’t last as long. Nothing like rancid smelling chapstick. I love the rose scented ideas too! Alkanet is inexpensive and takes very little to get a beautiful hue! Love this! 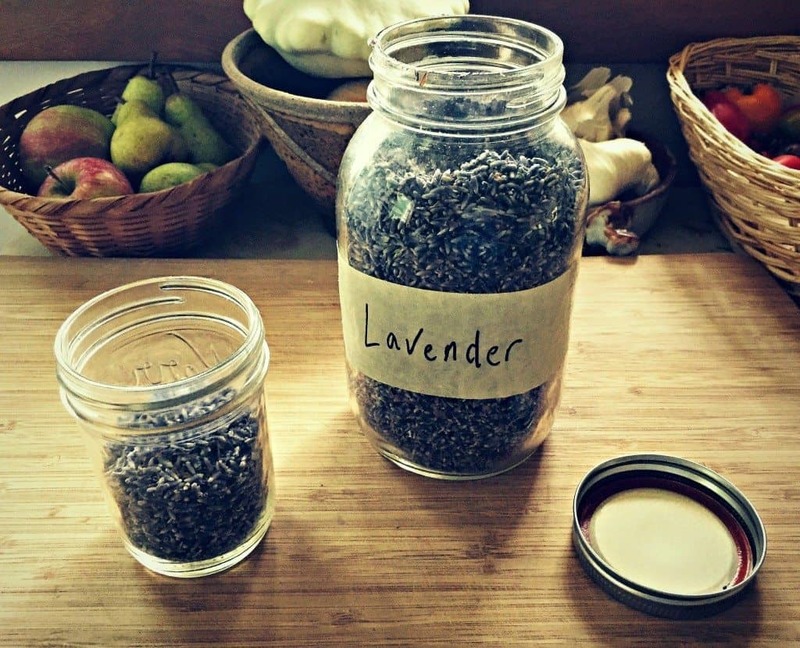 I infused lavender in grape seed oil to use for some facial care. After I strained the oil, I ran the lavender buds thru my food processor, then mixed it with some Epsom salts and some of my wonderfully scented oil to make a body scrub. Ooooh! I like that idea for using the lavender buds afterward! Wow that’s a great idea!!! If infusing thru the long method, leaving it for weeks in the sun, how would that work w coconut oil? Is it still infusing if the coconut oil goes hard? One more question, is hanging up herbs for days/weeks a good drying method? More info on oils, have several herbs growing in my yard . All info is great???? When infusing oils it always says to leave about an inch of oil at the top with the herbs completely covered. Mine always float to the top and kinda poke through the oil. Will that spoil the infusion? How do you keep the herb from floating to the top and poking through the oil? If you are using herbs that are completely dry I wouldn’t worry about it. 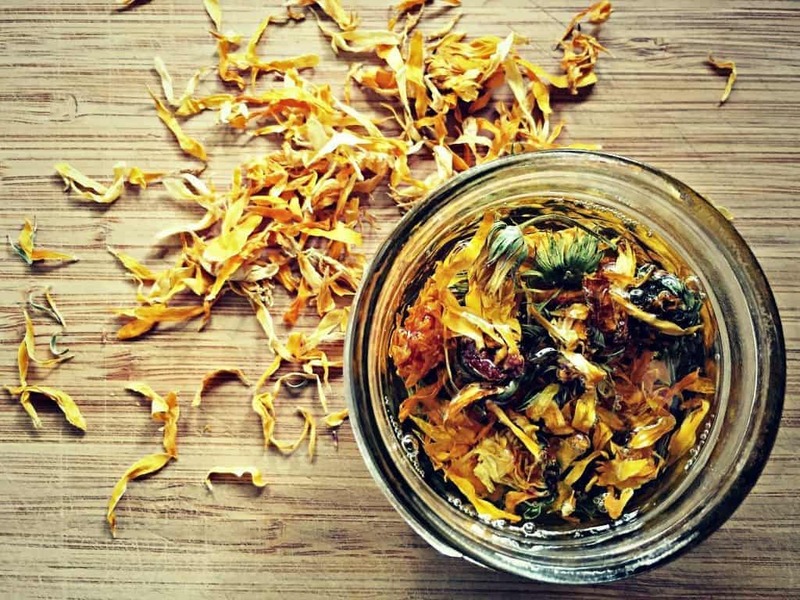 Ive put calendula in a jar with oil now for 6 months – is this good or do I throw it? If it is clear and not cloudy, it should be good. Does it smell rancid? Can chamomile teabags be used to infuse oils? This is great. I am so glad I discovered your site. Can’t wait to use my lavender today. Hi! I am wondering about the Calendula infused oil for the diaper cream. How much lavender and how long should it sit in the calendula oil for it to be infused enough for the diaper ointment? hi, you weren’t clear on the amounts of oil, and herbs ? Does it matter how much I use? Can the herbs be used for anything afterwards,or do they have to be thrown out? I use would like to know after making herb olive oil where will I use this oil. Please can you let me know. Can I eat it or use in recipes. While you could probably eat it depending on what herbs you use, that’s not really what it’s for and it probably wouldn’t taste very good! Herbal infused oils are the basis for salves, creams, lotions, and other topical products. Okay I was able to read your instructions to see what I missed. So you 1st place the herbs in a jar and you cover them with a carrier oil 1 inch above the herbs. 2nd you set the jars in a crockpot filing it maybe half way with water? on the setting of low, for about an hour and not allowing the temperature to go over 200 degrees, 3rd once finished you strain the oil out and its ready for use?